One of the many features Pushwoosh provides is a bit underestimated by small to medium projects, which grow rapidly and successfully. It’s called Send Rate, and it lets you limiting delivery rate in order to protect your backend from unexpected overload. 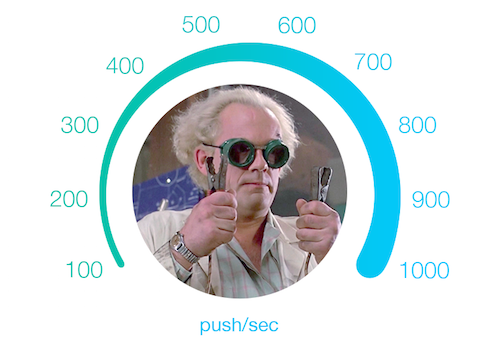 We’ve been historically sending push notification with really high speed even in Pushwoosh Public Cloud, without limitation such as with some of our competitors. And this is awesome indeed as it provides infinite possibilities in addressing your user base. But in spite of all advantages this feature grants, there is a peril lurking in the shadows. Someone can get hurt, and we talk about clients’ server capabilities. Once upon a time we were receiving numerous requests for a possibility to set a limit on a push notifications send rate, because customers’ backend couldn’t handle huge amount of simultaneous app opening requests. For instance, you are sending push notifications to one million devices telling that your online store provides big discounts for a limited period of time. As soon as users receive the good news, they’ll most likely visit your site to check discounts and buy something. So it’s easy to imagine what will happen if too many users visit your site simultaneously. If your server is not capable of handling high load – it will crash. After years of polishing our delivery system we found out that we were just too fast, all of a sudden. We had to find the way to accommodate the diversity of each and every project and implemented the Throttling feature, so that now you can delicately tune the send rate for a particular push. Again, there is no default limitation, unless you specifically check the Send Rate box and choose a value between 100 and 1000 pushes/second. It is that simple! Just remember, it might take quite a long time to send all pushes out if you set and extremely low value. Any questions on any Pushwoosh functionality? Feel free to contact us with your questions and tips!